I’ve been seeing an increase in people coming in with digestive problems, and it correlates interestingly with a little revolution in my personal dietary habits. 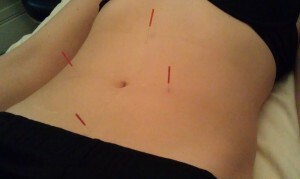 Acupuncture for digestive upset – in this case nausea and “grumbling” intestines. Last month I gave you a recipe for steel cut oats. They are far healthier than regular cereal for breakfast, but ironically, I am longer eating those oats… I’m off grains for the time being. A high-carb/low fat diet is not consistent with our hunter-gatherer evolution, and for some people it causes all sorts of problems, from weight gain to heartburn. I’m reading an amazing book called “Primal Body, Primal Mind.” The author cites a satisfying glut of scientific sources. The information in it resonates strongly with everything I know about physiology, and everything I’ve experienced in my personal struggles with weight. I’ve known for ages that bread is bad for me (very bad for me personally – your metabolism may differ), but it took reading this book to get up the motivation to quit. Working out and eating a “healthy diet” wasn’t doing it… but this seems to be doing the trick. It’s too early to say for sure, but I *am* losing weight and feeling good. My clothes are finally getting looser! 1) Processed food is no substitute for actual, human-made food. If the majority of your meals are coming in bags and boxes, you need to reevaluate. 2) Empty calories (white bread, pasta, and other starches) and sugars lead to chronic inflammation, fat storage, and blood sugar problems. Put down that soda and have some water instead. 3) Fats are not the enemy. We need fats for brain function, neural insulation, and padding for organs, among other things. The trick is to get them from good sources like extra-virgin olive oil, avocados, fish, and grass-fed meats, rather than chemically-altered trans-fats. Delicious and nutritious! 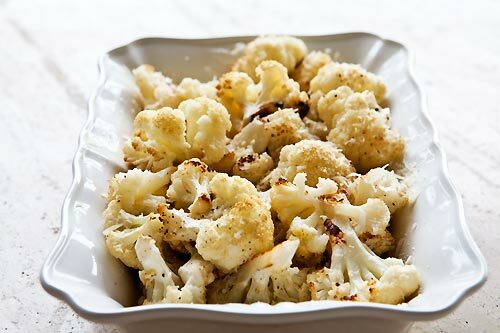 Cauliflower fights cancer and has a surprising amount of Vitamins C and K (important for antioxidant and anti-inflammatory function). Of course it’s also a great source of fiber. This entry was posted in Food, Healthy lifestyle and tagged acupuncture, anti-inflammatory diet, diet, lifestyle changes, nutrition, pain management by Sharon Rose. Bookmark the permalink.